An electrician who bought three stun guns online to “see how they worked” escaped a jail sentence. Police raided David Ruane’s former home in Stenhousemuir after Border Force officials intercepted a parcel containing one of the weapons. They found two more disguised as torches – which the 49-year-old father-of-two claimed he had no intention of using. The Border Force discovered the stun gun at Heathrow Airport in a parcel sent from Poland in December 2014. Officers found two more in the pocket of a leather jacket belonging to Ruane at his home, and a can of CS spray in a coat of his wife’s. Ruane, of Grahams Road, Falkirk, was interviewed and told police he was “interested in gadgets and used the internet to search for things”. 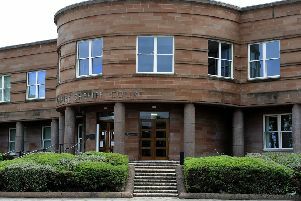 He was sentenced at Falkirk Sheriff Court after pleading guilty in November to possessing and attempting to possess prohibited weapons. Simon Hutchison, defending, said the father-of-two had “an inquiring mind” who wanted to “physically understand” the workings of the weapons by taking one to bits. The solicitor added that his client was a: “gentleman of substantial means” who should “not be going to prison for such a matter”. Sheriff Caldwell said: “I am very concerned that you had this sort of item out and about with you in your pocket. I simply don’t accept the assertion that there was no intention to use it. Sheriff Caldwell placed Ruane on a community payback order for 12 months with the condition he carry out 240 hours of unpaid work.